I used to make birds like this when I was a kid, flying them all around the house and yard. Usually we just run around and they flap through the air like a wild kite. 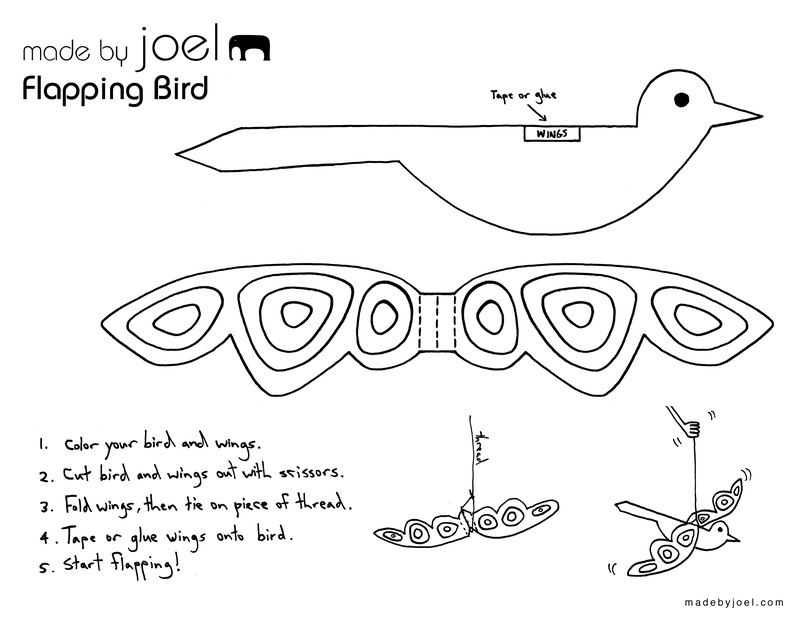 But if you’re in the mood, you can try to flap the wings and glide them around too. I also made a quick video you can show to your kids to get them excited about the craft! Click on the template below, then print! Thank you joel thank you You brought me back to my childhood! You are always so generous sharing your craft projects/ideas, thank you! You are awesome and your projects are awesome! I also like your background music w the didgeridoo, who is it? Thanks for the very kind comment Nancy! And I always like making my own music for my videos. I used to write a lot of music and play shows before my kids craft life. This particular one was just made with mostly Apple Loops. Glad you liked it! My kids and I started out our first day of summer break with this project. They are 2 and 5 and they both LOVED making these birds. I did, too, I will admit! Now they are both engaged in pretend play with their birdies. The little guy has his hanging out the end of a teapot and is serving "bird tea." I always love your simple, open-ended projects because they encourage my kids to PLAY! Thank you for sharing this project. We also loved the little video! I am eying the colorsheets for our summer car trips! Thanks again! Your website is one of my very favorites! Thanks Daicia! What a kind comment! I love watching what kids come up with while they're playing. "Bird tea" - Awesome! Thanks again, and I hope you have a great summer. I've got quite a few projects that I'll be posting to keep kids entertained and excited about art and craft! Coup de cœur pour un mobile-oiseau Made By Joël! Thank you so much for sharing your work. My daughter and I really love the flapping birds!